Ligularia (leopard plant) is a genus of robust Old World herbaceous perennial plants in the groundsel tribe within the sunflower family. They have yellow or orange composite flower heads with brown or yellow central disc florets, and are native to damp habitats mostly in central and eastern Asia, with a few species from Europe. There are about 120 to 140 species in the genus, and over half are endemic to China. 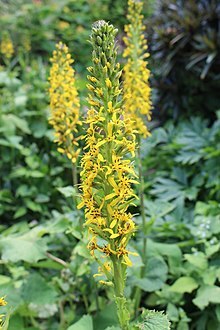 The name Ligularia, from the Latin for "strap", refers to the shape of the ray florets. Some species are cultivated as ornamentals. The cultivars ‘Britt Marie Crawford’ 'Gregynog Gold' and 'The Rocket' have gained the Royal Horticultural Society's Award of Garden Merit. ^ This article incorporates text from a publication now in the public domain: Porter, Noah, ed. (1913). "Webster's entry needed". Webster's Dictionary. Springfield, Massachusetts: C. & G. Merriam Co.
^ Liu, J. Q., et al. (2006). Radiation and diversification within the Ligularia–Cremanthodium–Parasenecio complex (Asteraceae) triggered by uplift of the Qinghai-Tibetan Plateau. Molecular Phylogenetics and Evolution 38(1) 31-49. ^ Flora of China Vol. 20-21 Page 376 橐吾属 tuo wu shu Ligularia Cass. .
^ Coombes, A. J. (2012). The A to Z of Plant Names. USA: Timber Press. p. 312. ISBN 9781604691962. ^ "RHS Plantfinder - Ligularia 'Britt Marie Crawford'". Retrieved 7 March 2018. ^ "RHS Plant Selector - Ligularia 'Gregynog Gold'". Retrieved 21 May 2013. ^ "RHS Plant Selector - Ligularia 'The Rocket'". Retrieved 21 May 2013. ^ "AGM Plants - Ornamental" (PDF). Royal Horticultural Society. July 2017. p. 60. Retrieved 22 March 2018. This Senecioneae-related article is a stub. You can help Wikipedia by expanding it. This page was last edited on 14 May 2018, at 16:37 (UTC).